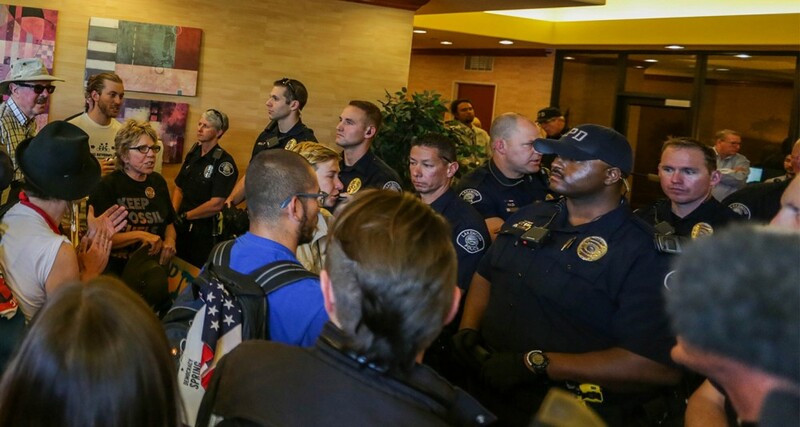 When more than 300 protesters assembled in May at the Holiday Inn in Lakewood, Colorado — the venue chosen by the Bureau of Land Management (BLM) for an auction of oil and gas leases on public lands — several of the demonstrators were in fact undercover agents sent by law enforcement to keep tabs on the demonstration, according to emails obtained by The Intercept. The “Keep it in the Ground” movement, a broad effort to block the development of drilling projects, has rapidly gained traction over the last year, raising pressure on the Obama administration to curtail hydraulic fracturing, known as fracking, and coal mining on federal public lands. In response, government agencies and industry groups have sharply criticized the activists in public, while quietly moving to track their activities. The emails, which were obtained through an open records act request, show that the Lakewood Police Department collected details about the protest from undercover officers as the event was being planned. During the auction, both local law enforcement and federal agents went undercover among the protesters. The protesters waved signs and marched outside of the Holiday Inn. The auction went on as planned and there were no arrests. BLM reimbursed the Lakewood police for costs associated with covering the protest, the emails and a scanned copy of the check show. the Holiday Inn of Lakewood, Colorado, May 12, 2016. Despite a relatively uncontroversial protest, the tactics revealed by the emails, recent public statements, and other maneuvers suggest that the federal government is beginning to take a more aggressive stance toward the Keep it in the Ground movement. During a congressional hearing in March, Neil Kornze — the agency’s Director and former senior policy advisor for U.S. Senate Minority Leader Harry Reid — appeared to compare the anti-fracking activists to the armed anti-government militia members who occupied the Malheur National Wildlife Refuge in Oregon. “We have had a situation where we have had militia; we’ve had people raising arms at different times. We are on heightened alert and we are concerned about safety. And so a situation that we are not used to, separating out who is a bidder and who is not, gives us pause,” Kornze said, explaining to GOP congressman that his agency faced “abnormal security” concerns. In recent years federal and private sector groups have poured resources into surveilling environmental organizations. In 2013, The Guardian revealed that the FBI had spied on activists organizing opposition to the Keystone XL pipeline. The agency “collated inside knowledge about forthcoming protests, documented the identities of individuals photographing oil-related infrastructure, scrutinized police intelligence and cultivated at least one informant.” The FBI later confirmedthat the investigation violated its own guidelines. to protest the auctioning of public lands for oil and gas companies, May 12, 2016. The focus on preventing the leasing of public lands for fracking gained national headlines in 2008 when activist Tim DeChristopher successfully bid on 22,000 acres of oil and gas land in Utah. DeChristopher, who servedtwo years in prison, did not intend to pay but won the bid in order to disrupt the auction and call attention to the leasing program. That pricing regime allows private corporations to pay deeply discounted rates — as little as $1.50 per acre — for drilling rights. 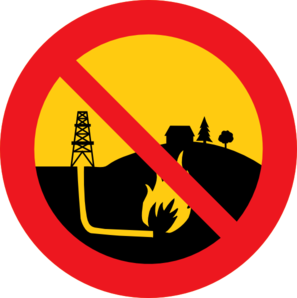 In 2009, the U.S. Department of Interior’s Office of Inspector General released a report calling on the bureau to do a study on “which auction process is best suited for oil and gas leases” in order to prevent the next Tim DeChristopher, whose action landed an explicit mention in the report’s introduction. 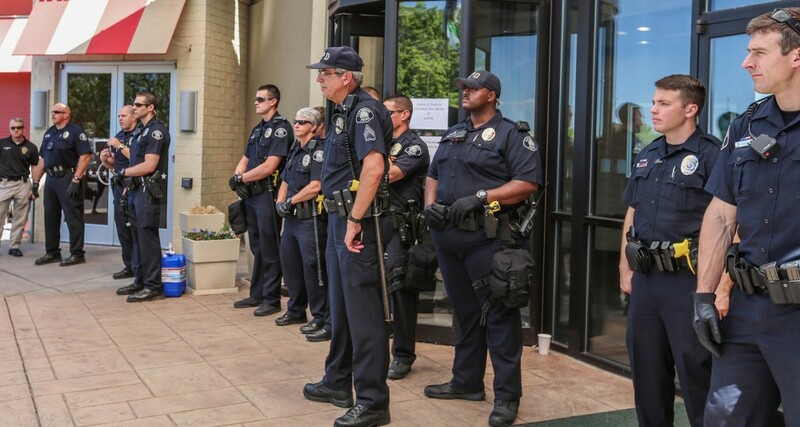 An email exchange from the day before the Lakewood Holiday Inn action shows both a Lakewood police officer and BLM officer on high alert about the possibility of another DeChristopher-type action taking place. Among the choices laid out in the report as a possible new bidding method was online bidding. Just days after the Lakewood protest, Kathleen Sgamma — a lobbyist for industry-funded group Western Energy Alliance — advocated for online bidding as a means to “end the circus.” In a May 18 email, BLM Office of Law Enforcement Special Agent-in-Charge Gary Mannino thanked Lakewood Police Chief Kevin Paletta for his department’s help and conveyed that public auctions could soon become a thing of the past. Congress has followed suit. On June 24, Rep. Alan Lowenthal, D-Calif., and Rep. Garret Graves, R-La., introduced Innovation in Offshore Leasing Act (H.R. 5577), which calls for online bidding for oil and gas contained in waters controlled by the federal government. On July 6, the U.S. House Subcommittee on Energy and Mineral Resources held a hearing on the bill and it has since passed out of the House Natural Resources Committee. While the oil and gas industry has come out in support of online bidding, and one contractor in particular named EnergyNet stands to profit from such an arrangement, several environmental groups issued a statementdecrying the shift toward online bidding. EnergyNet, whose CEO testified at the June 24 congressional hearing, will oversee a September 20 BLM auction originally scheduled to unfold in Washington, D.C.
Two recently-released studies concluded that phasing out fossil fuel leases on public lands is crucial for meeting the 2° C climate change temperature-rise goal, with one concluding that even burning the existing fossil fuels already leased on public lands would surpass the 2° C goal. After the release of those two studies, environmental groups filed a legal petition with the Interior Department calling for a moratorium on federal fossil fuels leases.